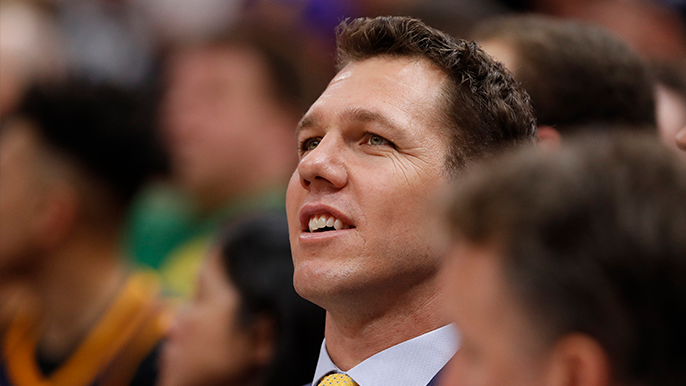 Luke Walton lost his job on Friday. He was unemployed for a day. Friday afternoon the Los Angeles Lakers announced they were firing Walton after three years as the team’s head coach. The former Warriors assistant immediately garnered interest from the Sacramento Kings who had just fired their own coach, Dave Joerger. Saturday afternoon, Sam Amick of The Athletic announced that Walton has agreed to become the next head coach of the Kings. Walton’s tenure with the Lakers was rather unsuccessful from a wins and losses perspective. There were rumors that the Walton was struggling to connect with his players in his final year as coach, and it was even reported that he got into a ‘heated exchange’ with veterans Michael Beasley, Lance Stephenson and JaVale McGee following a 14-point loss to the Warriors in early February. Following his departure from the Lakers, Warriors Head Coach Steve Kerr gave his thoughts on Walton’s firing, discussing the unfortunate situation he inherited when he joined the Lakers. Amick reported that Walton’s contract is expected to be around three or four years. Taking over an up-and-coming Kings team, Walton could be set up for better success in Sacramento with one of the best young rosters in the league.